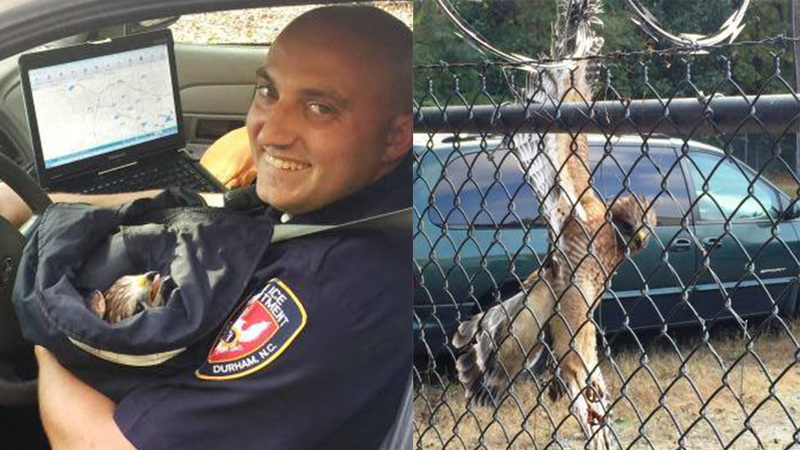 DURHAM (WTVD) -- Durham police are receiving praise after they helped rescue an injured red-shouldered hawk. On Sunday, officers received a call about a hawk that was trapped in a barbed wire fence on Hillsborough Road. Police said a city employee had called 911 to report that the bird's wing was stuck, hanging from the tip of its wing and struggling to break free. So, officers J.E. Harris, D.A. Monroe, and Lt. Tony Villanova quickly jumped into action. According to the department's Facebook, Harris approached the bird and used his cold weather police jacket to safely restrain the bird. Then, he kept the bird still and calm while Monroe freed its wing from the fence. Harris wrapped the exhausted bird up in the jacket and it was taken Triangle Veterinary Referral Hospital. Hospital officials contacted CLAWS, Inc., a rehabilitation facility, who are helping treat the injured bird. "It was awesome to see so many people come together to rescue this injured hawk," the Facebook post read. "We would like to thank Officers Harris and Monroe, Reserve Lt. Villanova, 911 Dispatcher Kendal Medlin, the City of Durham employee who called 911 to get help for the bird, Triangle Veterinary Referral Hospital and CLAWS, Inc."